1)A near field probe helps us visualize potential sources of error by only picking up signals close to the probe head and in the correct orientation. This helps us to identify parts of our board or product that our actually emitting the problem signals. Using a calibrated far field antenna an engineer can closely approximate a full compliance test creating reliable measurements on the amplitude of the signals in question. Comparing these power levels to the relevant compliance limits enables an engineer to understand how much headroom they have in their design and ultimately whether or not it will pass a compliance test. 2)One other aspect of radiated emissions is cable emissions testing. Connected data cables such as USB or HDMI can act as antennas as well. Current clamps and probes as well as amplifiers may be needed to fully characterize these emissions. Having these cables attached and powered up can make a significant difference in near and far field measurements. Cabling should always be considered when testing emissions. RIGOL supports engineers by providing instruments, probes, and software programs that can adjust for calibrated antennas and varying emissions limits in a variety of radiated testing. RIGOL helps customers capture, adjust, and analyze radiated emissions data to speed a project’s time to market by identifying potential problems before they require extensive rework that extends the design cycle. Pre-Compliance Conducted Emissions is how engineers test for unintended power that gets coupled or transmitted back into the power line. The focus these regulations is to make sure the power line remains ‘clean’ and that other devices on the circuit and the power grid won’t be effected. To isolate the measurements from the power line noise and provide a stable impedance for these measurements a LISN or Line Impedance Stabilization Network is used. Additional hardware such as attenuators and transient limiters may be used to optimize the measurement system to test a certain device. Pre-Compliance testing of conducted emissions helps engineers avoid costly errors in their power supply design or procurement. 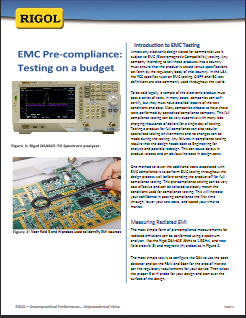 For engineers selecting an off the shelf AC-DC power adaptor for their product, a basic conducted emissions test can make procurement decisions easier and eliminate surprises at the compliance lab. RIGOL Spectrum Analyzers and S1210 EMI Pre-Compliance software can be configured to adjust for correction factors from LISNs, attenuators, and other devices. This enables engineers to confidently take their product to a compliance lab with high confidence of passing the first time. Learn more about proper test techniques for performing precompliance conducted emissions testing using a spectrum analyzer including test setup, common error sources, and instrument configuration. 1) Modulated waves – Often AM modulated waves across the frequency ranges of interest. These waves test the product’s ability to ignore power at frequencies that may be coupled into the device over time. These signals may effect a product’s communication, reliability, or logic. 2) Pulsed and Burst waves – These transients affect a device immediately and can cause a number of power and functional issues. Electrostatic discharge or ESD testing is a common type of transient immunity testing. These fast pulses can have different effects on a product and need to be considered as a potential source of reliability and functional issues. In addition to RIGOL’s other Pre-Compliance instrumentation, immunity testing requires an RF source to generate high power modulated waves. Other types of equipment may need to be purchased for transient generation. 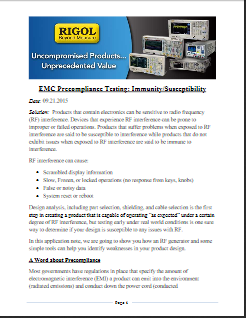 How to use an RF generator to test radiated immunity and susceptibility. analyzer shall measure the conducted emissions on both line and neutral. The value of the parallel combination of the capacitors is 12μF from line and neutral to ground. This causes around 0.75A flowing into the earth connection and would trip the ground fault switch. Hence, an insulation transformer is required and good grounding is essential for safety. a limiter between the LISN RF output and spectrum analyzer is essential for the protection of the equipment. Terminate any of the two ports of the TEM cell with the 50Ω load, connect the DC-Block to the other port and connect it to the input of the spectrum analyzer. Place the DUT under the septum and power it on. As a rule of thumb, given that the PCB is positioned not much higher than 1-2cm above the bottom wall, any spurious with amplitudes higher than 40dμV may potentially cause a failed compliance test. 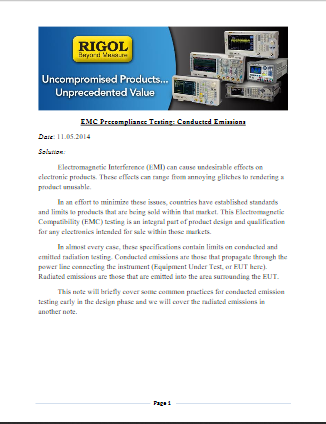 Use compliance tested DUTs and the corresponding test reports as a reference for measurements in the TEM cell. Localize the source of unwanted emissions on the DUT PCB using near field probes and a spectrum analyzer. Terminate any of the two ports of the TEM cell with the 50Ω load, and connect the signal generator + power amplifier to the other port. The signal needs to be AM modulated (80%) according to most standards. The power of the signal has to be chosen according to the required field strength. Place the DUT under the septum and power it on. Sweep the signal generator and monitor the DUT for RF immunity issues. The picture above shows a minimum setup. Inserting a directional coupler with connected RF power meter in between power amplifier and TEM cell would be of advantage to monitor power levels. Localize the section on the DUT PCB which is susceptible to RF. Use a power amplifier only, if the output power of the Signal generator alone was not sufficient to reproduce the immunity issue. Implement counter measures and re-test the DUT inside the TEM cell to verify if the modifications removed the RF immunity issues.